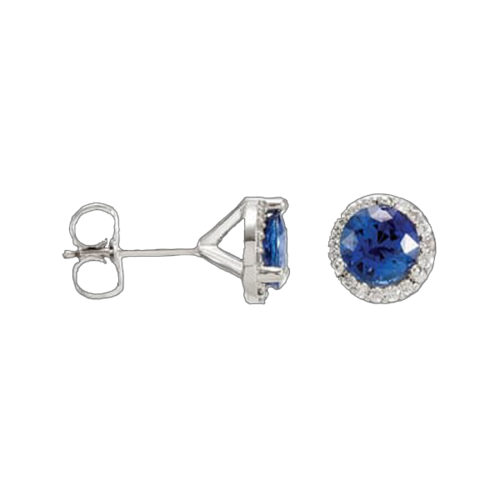 Gorgeous 14k White gold earrings hold a 5.5mm AA quality faceted Ceylon blue sapphire surrounded with diamonds. Diamonds total 1/6ct tw. Lovely Ceylon blue sapphires total approx. 1.60ct tw. You'll love these incredible Sapphire and Diamond earrings today and for years to come. 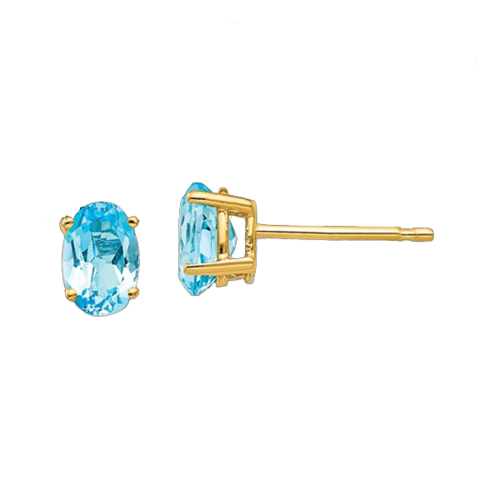 Striking 14k gold Aquamarine and Diamond earrings. This pair of earrings is a hoop with dangle design set with diamonds along the front of the hoop and a small cluster finishing the drop. Genuine Aquamarine measures 7x5mm oval and diamonds total 1/6ctw in this pair. We offer these in 14k Rose gold, 14k White gold, and 14k Yellow gold. 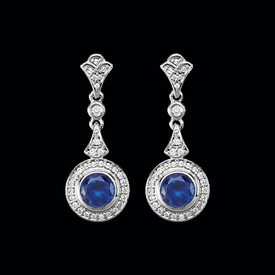 Beautiful 14k white gold Diamond and Blue Sapphire earrings. Diamonds form a cluster in the center surround with a halo of Blue Sapphires. Diamonds total 5 /8ctw in this pair of earrings. 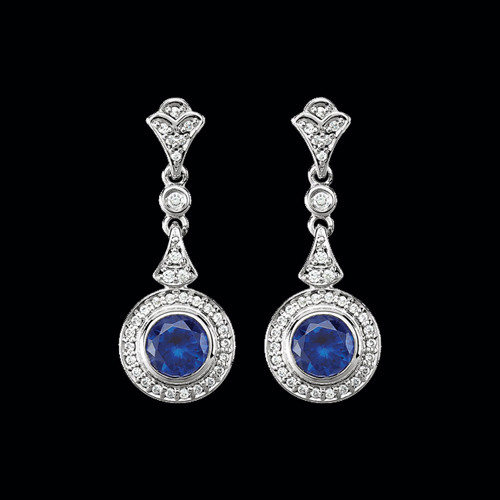 This pair of earrings has is all, vibrant Sapphires, diamonds, and a halo design. Incredible 14k yellow gold large Swiss blue topaz earrings. Swiss Blue Topaz are antique square checkerboard cut gems AA quality and measure an awesome 10x10mm each. Beautiful dangle earrings full of color. 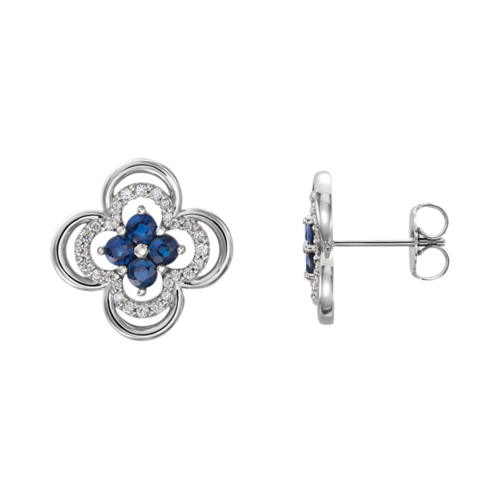 Sparkling Blue Sapphire and Diamond clover style earrings. 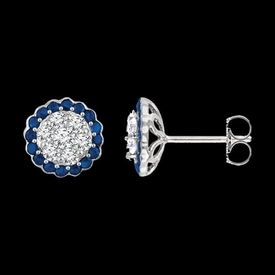 These delightful earrings measure 12.7mm in diameter and are set with 8 genuine Blue Sapphire and 1/5ctw diamonds. Matching necklace and ring also available. Special order these in 14k yellow, white, or rose gold. Also available in Platinum. Precious 14k Rose gold Baby Pink Topaz and Diamond earrings. Diamonds total 1/3ctw in this lovely pair of earrings. Each genuine Topaz Passion measure 8x6mm oval. A beautiful pair or earrings. Beautiful 14k White gold Gemstone and diamond earrings. This great design is available with a variety of vibrant gemstone centers each accented with 1/10 ctw diamonds. Center gemstone is 5x5mm cushion cut stone. Prices vary depending on the center stone selected. Selections include Amethyst, Aquamarine, Citrine, Mozambique Garnet, Opal, Peridot, or beautiful Sky Blue Topaz. Something for every mood. Pretty 14k Yellow or White gold set with oval Blue Topaz gemstones. Earrings are available in a variety of great sizes starting with a 6x4 oval. Blue Topaz is a light blue color. Price is per pair, earrings arrive in a lovely gift box. 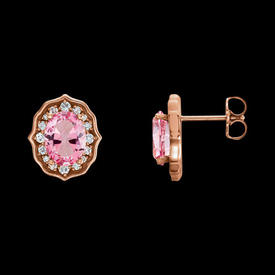 Shade of Pink Rose gold earrings. 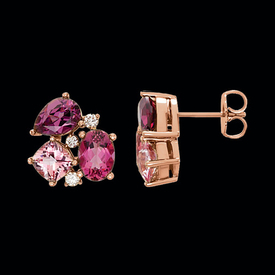 Romantic Pink Gold set with multiple pink gemstones and diamond accents create these lovely earrings. These 14k rose gold earrings are set with an antique square checkerboard cut Genuine Topaz passion each measuring 5mm x 5mm, pear shape Rhodolite Garnet measure 7mm x 5mm , and genuine Pink Tourmaline are oval and 7mm x 5mm. Diamonds total 1//6ctw and are a vibrant accent at 1.7mm round each. A very feminine pair of earrings. 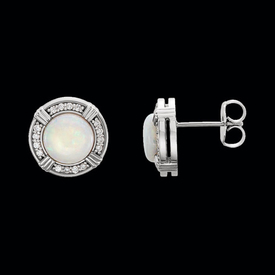 Lovely Opal earrings with a wheat border in 14k white gold. This pair of earrings is shown in 14k white gold but also available in 14k yellow, rose gold, or Platinum by special order. 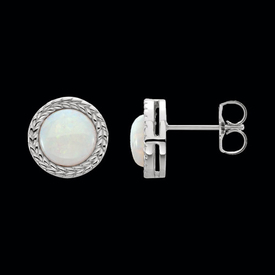 Genuine Opals are 7mm round and accented with a wheat design border. 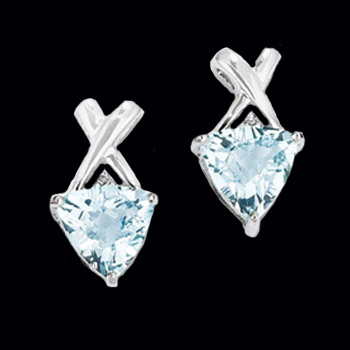 Beautiful 14k White gold Swiss Blue Topaz and diamond earrings. 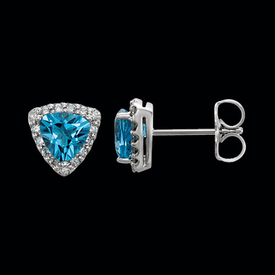 Swiss Blue Topaz are vibrant trillion cut stones and surrounded with .08ctw diamonds. Each Topaz measures 5mm. 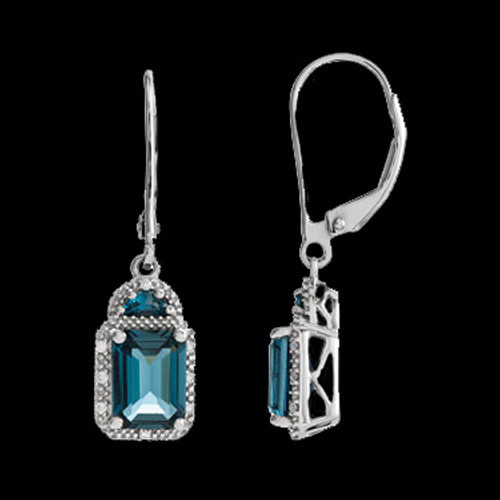 A great pair of diamond and blue topaz gemstone earrings. Lovely Opal earrings with a diamond Halo. This pair of earrings is shown in 14k white gold but also available in 14k yellow, rose gold, or Platinum by special order. Genuine Opals are 7mm round and accented with a halo of diamonds. Diamonds total 1/6ctw for the pair. 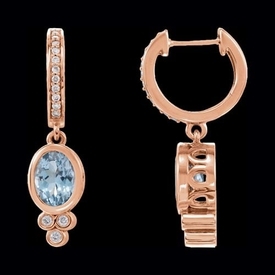 Stunning 14k gold London Blue Topaz and diamond earrings. This made to order earring is available in a large variety of gemstone centers, use our request email for pricing. Diamonds are SI 1 clarity G0H color and total about 1/5ct tw in this pair of earrings. Beautiful Halo-style large gemstone and diamond earrings. 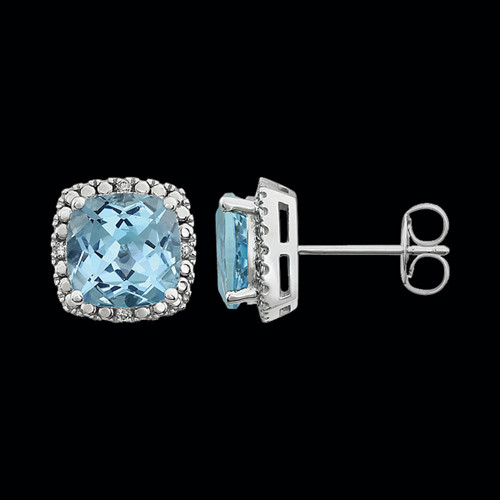 Shown is the vibrant Sky Blue Topaz, gem measures 8mm and is a cushion cut gemstone, accent diamonds total .06ctw. This earring measures 10.2mm and is available in a variety of gemstone selections. Gemstones include Amethyst, Sky Blue Topaz, Mozambique Garnet, and Onyx. A great pair of large gemstone earrings. 14k Yellow or White gold Blue Topaz earring studs. 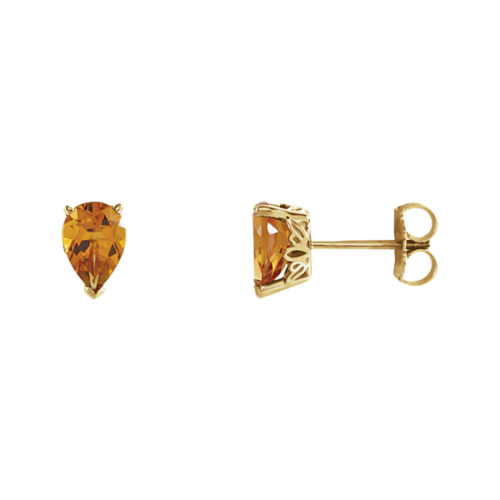 These topaz gemstone earring studs are a great jewelry staple. This lovely earring is available in a variety of sizes starting with the 4mm round selection. Price is per pair, arrives in a gift box perfect for giving. 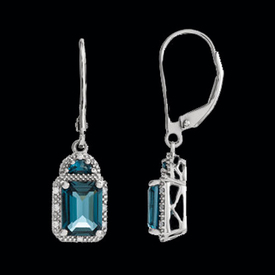 Lovely London Blue Topaz dangle earrings. 14k White gold holds a unique half moon London Blue topaz on the top part of this earring design with a large 8x6mm London Blue Topaz emerald cut gem below. Diamonds create a little accent just for fun. Earrings measure 30.7mm top to bottom by 7.6mm wide. Striking 18k white gold belt buckle design blue sapphire and diamond earrings. These incredible earrings are set with blue sapphire that total 1.24cts and SI2 clarity H color diamonds add 1.05cts to these earrings. Total carat weight for these Sapphire and Diamond belt buckle earrings is 2.29ctw tw. 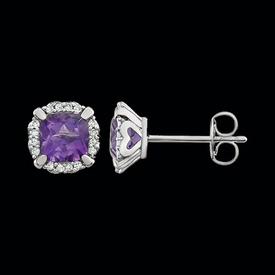 Earrings feature an omega back clip. 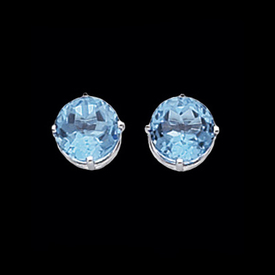 Lovely 14k white gold Blue topaz trillion earrings. 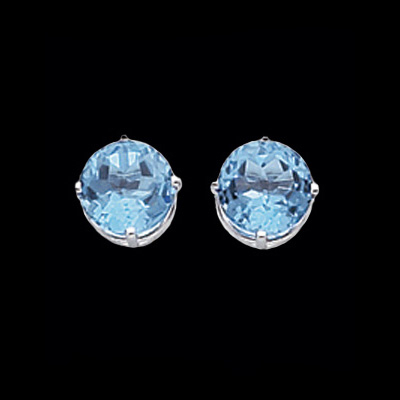 Genuine blue topaz are a gorgeous trillion shape faceted gem and weigh 1.88ct tw for the pair. Pretty 14k white gold "X" design sits above the gem creating these great earrings. 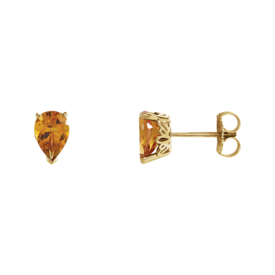 These adorable studs are a great wear anytime earring or a nice gift idea.